This tutorial will show you how to optimize your scenes with Shader Utilities for IBL Renderings. All Renderings without Final Gathering or irradiance Particle, only IBL-Environment Map. To simualate IBL-Light we need a HDRI or OpenExr Picture. Put the Panorama HDRI in the Environment Slot by the „Environment and Effects“. The structure of the diagram: For the Envrionment Map use a Backgorund Switcher. They have two Slots „Eye“ + „Environment/Reflection“. For the Floor/Ground use a „Matte/Shadow/Reflection“ Material. 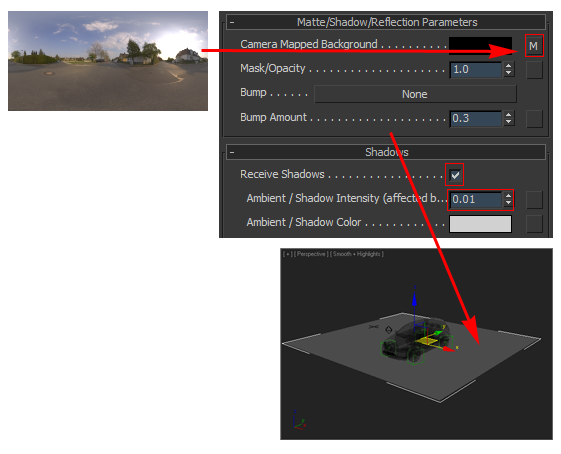 For a smooth blending between Background and Ground, use a Matte/Shadow/Reflection Material at the Ground. Put in the „Camera/Mapped/Background“ Slot a instance of the Environment Map. 2. overwrite 3DSMax Default Light. We want simulate the Light only from the HDRI. We must overwrite the 3dsmax Default light. Create a Omni-Light, and set „off“ the Omni-Light, for overwrite the Default Light. 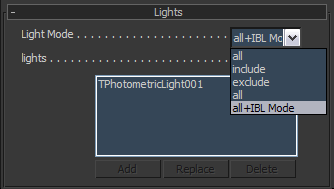 A Material can only get IBL Light, if the Light Mode Value 4. The following Materials are fixed for IBL Renderings. With the help of these functions, you can very quickly assign all A&D Material and convert to a TH-Generic Material. This give you a possibility of IBL-Rendering at 3dsmax2011. All illumination shaders above have a mode parameter and a lights parameter to control the set of lights which is used for illumination. Illumination is performed either using the light instances given in the lights parameter, or the light list of the geometry instance to be shaded. 0=all Light, 1=include Lights, 2=exclude Lights, 3=all Light, 4=IBL + all Light. Start SU- Pro and select at the Optionlist „IBL-Mode“. click the ON-Button to optimize all TH-Materials. The A&D Material don´t work at this time, because Autodesk vorget to set the correct Light Mode Value. Equivalent can you use the TH-Generic Material. Nice is that the Background-Switcher work 100% with IBL. The native IBL rendering is enabled by setting this option to a value other than „off“. The mode“light“ targets accurate results and will converge to the correct solution, albeit slow when using traditional shaders with strong, sharp glossy components. The „automatic“ mode is the suggested way of working, by providing a reasonable compromise between speed and quality. Its internal implementation may change between versions of mental ray. Currently, it corresponds to „light“ with additional usage of theenvironment lighting cache, to gain overall performance at the expense of final quality. The“approximate“ mode is targetted at fast results but delivers a biased, physically inaccurate result. It is intended for interactive applications rather than final quality renderings, and can be tuned with special options. It implies the use of environment lighting cache and environment lighting shadow „solid“. The environment is sampled and baked into data structures for accelerated lookup during rendering, see resolution. This setting determines if a regular texture is used, or a special cache providing optimized access. In the case of a texture, enabled with off, the usual texture lookup machinery is used, which includes standard filtering of the texels resulting in a smooth environment. If the cache is enabled with on, this filtering is not performed except for the directly visible environment. With extremely low environment lighting resolution settings, sharp texels may be visible in reflections. On the other hand, the cache will reduce noise. The impact will be more obvious with high contrast environments, low resolution, or scenes with mainly diffuse surfaces. The default is off. Control the quality of the IBL contribution. The quality value can range from 0.0 to 1.0 for lowest to hightest quality. The environment is sampled and baked into data structures for accelerated lookup during rendering. Higher resolution results in better quality but requires longer construction time and more memory. Lower resolution will lead to less detail like softer shadows and highlights even for strong hot spots in the environment. Note, that this setting is also relevant for iray. The default is 512. The illumination coming from the environment is multiplied by this factor, or by the color if individual r g b components have been provided. The directly visible environment is not affected. The default is 1.0. Specifies the number of samples to take per measurement in the pre-process. If the resolution is very low, this value can be used to increase the sampling quality of the environment to avoid losing lighting information by potential misses of small hot spots. Note, that higher values increase pre-processing time. This setting is also relevant for iray. The default is 2. In case of „approximate“ lighting mode, draws given number of additional samples from the environment internally. This can reduce color noise at the cost of biased results. Only values greater than 1 are recognized.Default Vaulue is 4, and Range from 1 – 20. 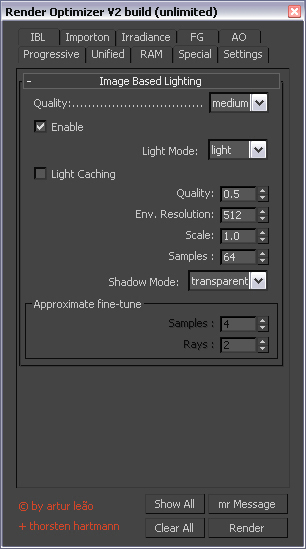 In case of „approximate“ lighting mode, cast the given number of visibility rays per internal sample. This can reduces the visibility noise at the espense of increased ray tracing overhead. The Default Vaulue is 2, and Range from 1 – 10. Control shadows cast by IBL. Disables shadow casting if set to „off“, enables opaque shadows if „solid“ or full shadowing calling shadow shaders if „transparent“. Optimize your Rendering with „Unified Sampling“ Method. Be careful, Unified Sampling otpimize all Sampling Typ ( Shadow, Glossy Reflection, Timesample…) at a scene. that increase the Rendertime, but give the best Result.